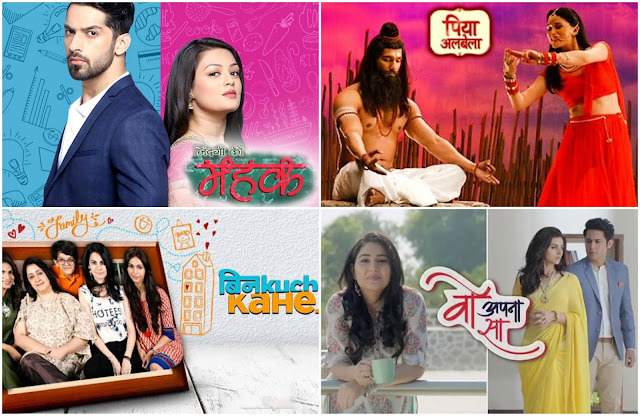 Zee TV launched some new TV shows which have changed the persona of the regular serials on saas-bahu sagas. There are 4 such shows Zindagi ki Mehak, Who Apna Sa, Bin Kuch Kahe & Piya Albela. Zindagi Ki Mehak is a TV serial currently running successfully on Zee TV. As the title says the story runs through the life of Mahek Sharma and Shaurya Khanna. Shaurya is restaurant owner who judges a cooking reality program in which Mehak is a contestant. Shaurya hates Mahek at the first impression itself and plays tactics to through her out of the show. The usual melodramatic situations which are a typical ingredient for its audience is also there in this story where Mahek is arranged to marry Ajay for which Shaurya gets irritated. The drama continues as Mahek’s cousin Neha is having an affair with Ajay but Ajay greedy of Mahek’s prize money rejects Neha. The brilliant chemistry between Shaurya, Mehak has resulted in the TRP ratings. The track were Mehak and Shaurya decides to marry, the marriage celebrations and how Shaurya left Mehak on the wedding day got immense popular. The current track is also gaining accolodes as they show Mehak is not scared of Shaurya behaviour, instead she fights to win her love back. Woh Apna Sa is just launched some weeks back. Based on the well-known Hollywood movie Stepmom, the promos did the work.They created high curiousity among the viewers thus getting quite a well reception. The story casts Disha Parmar and Ridhi Dogra, both are coming back after a sabaticial. It also has Sudeep Sahir the handsome and popular actor in the lead. The story starts with a family were the daughter in law Nisha is demanding and dominating in charater.She doesn't care about the people around her infact she wants to hurt them if it will benefit her.Much to her happiness Aditya her husband is helpless, doesn't stop her on many things. But slowly he bagan to see her true face, where she is trying to harm his family members for power.He decides to break the relationship as there is no love and everything is making him suffocated. Apart from the family there is Jhanvi who is the sole earner of her little home, runs the house and simply smilingly solve everyone's problems. Aditya is Jhanvi 's boss but they two have different opinions on many things. How the two will get together, we have to watch the show to know that. Bin Kuch Kahe tv show launched just 10 days before. The story revolves around 3 sisters living in a small town, their struggles, issues and dreams which will make you feel related to the concept. The story mostly focuses on their relationship with their mother. The leads are Shamata aanchan of Everest fame, and handsome newbie Sameer Arora. They both are two different personalities, eventually will fall in love with each other. The show has just started, so we have to wait for some time to see if the show will be liked by viewers or not. Piya Albela is an upcoming serial in Zee TV produced by Film Maker Suraj Barjatiya under the banner of Rajshri Productions. It is based on the Hindu mythological story of sage Vishvamitra and apasara Menaka. The story runs through Naren who is a nature lover and wants to help others. His family, traditionally a business family, wants him to take the family run business to new heights. The entry of a simple girl to Naren’s life changes things quite in a big way. The beauty of ancient story narrated in relevance to the modern world is the specialty of the whole serial. Though the concepts may sound similar but they are every bit different from other channels shows. Zee TV live maintains a distinctive way to entertain it's ardent viewers.